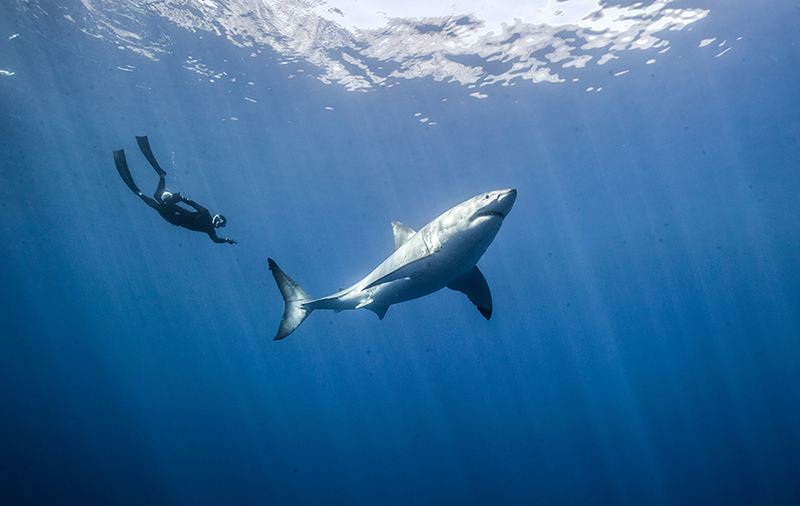 In 2012 William Winram led a Watermen Project expedition to the home of the biggest great white sharks in the world – Guadalupe Island, Mexico. The renowned filmmakers Steve McNicholas and Luke Cresswell captured The Watermen Project’s efforts to study one of the most maligned predators in the world, the great white shark. Without the use of a cage, Winram and his colleagues used the art of freediving to approach the iconic creatures and to study their movement patterns. This work became a key component of McNicholas’ and Cresswell’s IMAX movie Great White Shark 3D which has been seen in countries all around the world and impacted the hearts and minds of many. Shot on location in South Africa, New Zealand, Mexico and California, the film looks to find the truth behind the mythic creature forever stigmatised by its portrayal in the world’s first blockbuster movie, JAWS. Great whites pre-date the dinosaurs in evolutionary history, and have evolved to regulate their body temperature and give birth to live pups, much like mammals: yet we fail to look on them with the warmth we might afford land based carnivores such as lions, tigers and bears. GWS aims to reveal the strength and beauty of these animals by looking through the eyes of those who have been touched by their shark encounters.